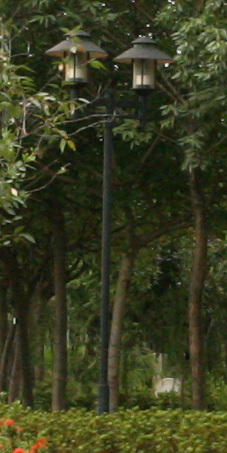 I was looking at the white sign "Quali Walk" "6=>" on the lamp post, at the top left corner of your pictures. Clearly, both Canon 17-40 and 24-70 were sharper than VS24-85 at the top left corner, so I wondered if that was what you were focusing on... and asked you that question. To sum up, from the two Canon pictures, what you focused on was less sharp than what you don't focused on! Strange. First of all thanks for reading the pictures in detail! Considering the setting for the test this time, i.e. 24mm and at f/8, would the DOF for all these 3 lenses still not enough to cover all the ranges from near and far as in the picture? (even a mis-focus did happen on the lamp post on the left hand side) I had been trying to figure out the answer also before I decided to post these pictures on the forum.............at lease what I can see are the lamp posts far away on the winding walkpath tend to be in focus in 3 of the pictures. The concepts of hyperfocal and DOF are based on a circle of confusion - a measure of what we consider as sharp. Usually, the CoC is chosen to be 0.03mm for 135 film and 0.025mm for APS. The EOS 5D has a pixel pitch of 8.2 micron, or 0.0082mm. So, according to DOF and hyperfocal theories, a blur of 3.7 pixels is still considered "sharp". Clearly, this is inadequate for critical lens testing. I found that even stopping down to f/8, I can still very easily find the focus plane by comparing relative sharpness. There must be a point in the picture where it is the sharpest. If that point is where you really intend to focus on, great. If not, it becomes an AF accuracy test instead of a lens test. Thanks for the technical information! I suppose I should stick with manual focus for the test next time for a better control of the result, or probably better with a tripod because I had to do it in rush this time. 1. although the two plates add up to be closest to 0.65mm, there is still a 0.03m difference. This 0.03mm is about 5% and 5% error on focusing can be a lot, especially at 85mm focucal length. If there is a 0.14m plate and it can be used to replace the 0.11mm plate, I think the focusing accuracy can be largely improved. 2. i am not sure if copper is a good material here as copper has very high expansivity. The thickness can vary a lot when temperature changes say from 0C to 30C. This further affect the focusing accuracy. Copper is also a soft material which can easiy lose its shape. Or is the material actually a copper alloy? Nevertheless, it is still an exciting trial! Excellent! The shims are not an end, it is a means. Zeiss publishes technical data of the Vario Sonnar 24-85 on its web site. The backfocus distance is 42.7mm at the wide end and 64.1mm at the tele end. After the lens has been manufactured, careful measurements are made, and enough shims are added to the lens to ensure the backfocus distance is as designed (42.7mm at wide end). The purpose of the shims is to control the backfocus distance. If the shims are off by 0.03mm, the backfocus distance will be off by only 0.07% (42.7mm vs 42.73mm). Think of this analogy: I needed to build a building which is 427m high, but I was cheap, I built it 420.8m high and put a 6.2m antenna on top. The antenna maker made a 5% error, and gave me a 6.5m antenna. Now my building is 427.3m tall - but that is only a small difference from my original design. Of course, being the kind of perfectionists we are, an error is an error. It becomes meaningless as we head down to the micron range, as the metal expansivity you mentioned kick in, and also metal compression as you tighten the screws (metal is malleable), not to mention that well-calibrated equipment is required to make a measurement that small. Therefore, many critical dimensions of a camera, such as film-to-flange distance, is toleranced to +/- 0.02mm or +/- 0.03mm. Ah forgot to mention the backfocus distance is defined to be the distance from the rear element to the film plane. For me, it's a great user test. It's a test done in a hurry, in a open area, hand-held, ISO 1600....Yet, the result is the most detailed piece of reference material available in the web so far. I am just hoping to see another detailed, scientific test from somebody else...... but who else? Of course, wah's contribution cannot be overemphasized. He is the first person in the world to get this new product installed. Sorry if I sounded like I was criticizing his test. That was not the intention. I was only trying to interpret his test results, given that, as Brian puts it, that is the most detailed piece of reference material available on the web so far. I don't recall seeing any other person doing any A/B comparison on the net. wah, the 300D samples on page 2 all look very good. Are they all taken with AF? I particularly like your "Perrier". Zoomed to the max, wide open, close focusing distance - the conditions are as tough as it gets for a zoom lens. The result, however, is surprisingly good! At 100% I can read the label very clearly, even some of the fine print. And, the barcode on the bottle - I can probably use a barcode scanner to scan your photo instead of the real bottle. Thank you for sharing with us these pictures! I have purchase one adaptor for makro-sonnar 100/2.8. I will test 1DsII+EF100/2.8 macro and 1DsII+makro-sonnar 100/2.8.